Imprinting your color logo on this 22 oz. aluminum bottle is sure to get your brand noticed. These custom reusable water bottles with carabiner and BPA-Free screw-on lid are great for back packs, working out or working at the office. Since we work straight with the factory we get low wholesale pricing that we in turn pass along to you. Select which of the eight colors that best suit your brand or look into our overseas production. 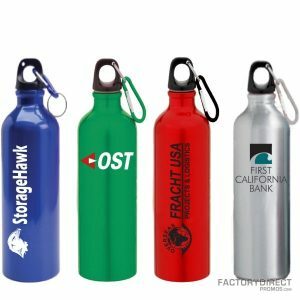 The advantage of ordering your product from our overseas source is that you can completely customize your eco-friendly water bottle all for a low price.